harryvainickis has no other items for sale. 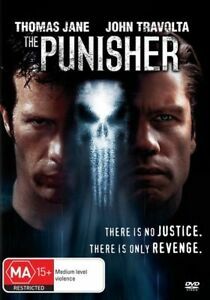 Rising star TOM JANE and superstar JOHN TRAVOLTA go head-to-head in the all-action blockbuster THE PUNISHER. Jane plays Frank Castle, an FBI agent whose family is brutally murdered in retaliation when an undercover operation goes wrong. Surviving the attack, Castle remakes himself as The Punisher a heavily armed, one-man killing machine who will not stop until sadistic crime boss Howard Saint (Travolta) has been brought downand his family has been avenged. As one man becomes judge, jury and executioner in this hard-hitting adaptation of the legendary Marvel Comic, THE PUNISHER delivers blistering action and all the big-screen excitement youre looking for. There is no Justice. There is only Revenge. [AUSTRALIA]= PAYPAL,cash,m/o,d/d,cheque.= POSTAGE AT COST. [ LOTS MAY BE COMBINED TO SAVE POSTAGE.] --OUTSIDE AUSTRALIA = PAYPAL.--CASH, US$ssss,EURO.= POSTAGE AT COST FOR INTERNATIONAL.